On a grand scale, perhaps no species is as ferocious as the human sort. We do quite well actually, and if some of the science right now is correct, we may, give or take a hundred years, have the entire grocery store to ourselves. One insect in particular that enjoys a big fan base in the martial world is the praying mantis. 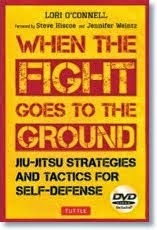 From the earliest narratives of martial artists intrigued by watching a mantis fight its battles for both food and survival to the historical branching out into human fighting system with many branches – Southern Mantis, 6 Harmony Praying Mantis, 7 Star Praying Mantis, 8 Step Praying Mantis, Tai Mantis, etc. – we, as humans, have developed a little critter’s daily functionality into a super sophisticated martial culture. What fascinates is the posture of the insect’s forelegs, and the way it uses them in a battle for supremacy. In imitation, we humans drop our elbows and scroll up three fingers from the little finger to the middle finger, while extending the index finger, reinforced by the thumb. 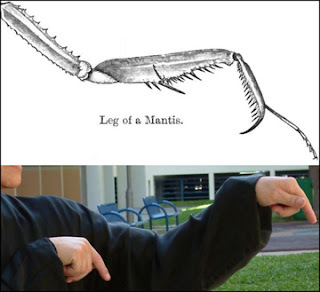 The hand posture symbolizes the mantis claw and has become overall one of the signatures of the northern Chinese mantis systems. 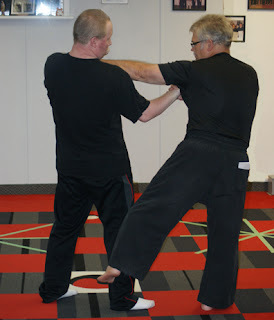 My first encounter with this posture was as the second movement of a famous set of movements called Bung Bo Kuen. It’s repeated several times in Bung Bo, and, of course, other mantis forms contain the movement the same movement. I’d like to go into some technical detail about the posture itself and attempt to lay out a description of its usage that will resonate with readers who may not be involved in the Praying Mantis arts but can find similarities in the martial arts that they do practise. At any time, please do not restrict yourselves into thinking just defense or just offense. 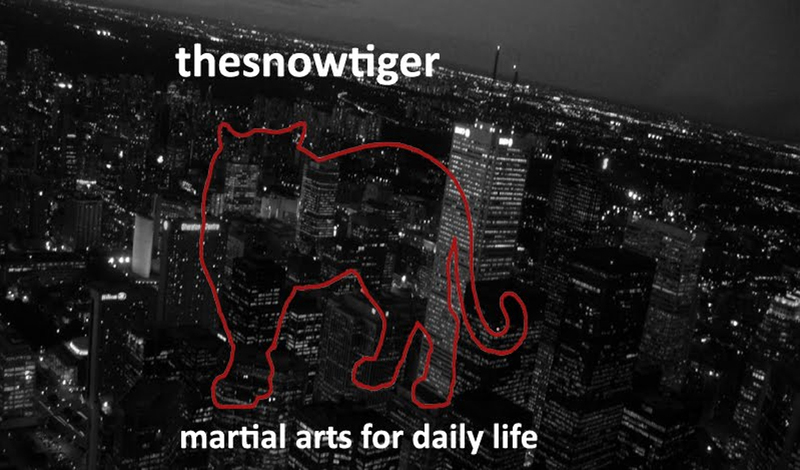 Yes, my elbows can be held low like a boxer’s to protect my ribs, and of course we can see that in the way Muay Thai fighters hold their arms out as well – defensive walls that protect the fighter’s sides as well as limit the amount of territory under attack down the body’s centre line. Every Karate practitioner adopts arm postures that will allow for maximum protection. Judo practitioners keep their elbows low to limit access; for leg-hip-elbow-shoulder gripping power and torque; to maintain a low centre of gravity; to help negotiate close in grappling; as well as to rapidly shift through various entry points. Mantis teaches us that offensive-defense are two divisive terms. 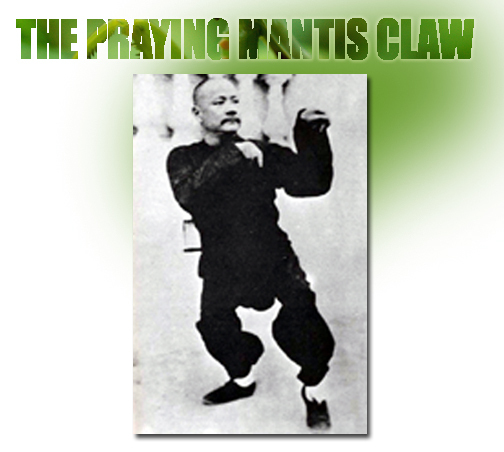 In Mantis, as in Wing Chun, Pak Mei, My Jong, Hsing I…only the flow counts, and as in a stream, the Mantis claw negotiates the current, indeed, it becomes the current. Offense/defense cease to matter; the flow of the fight matters most. So we have the dropped elbows which are, as we shall discover, fighting utensils. There is no one way in which to use the elbow; Mantis application informs us that there are dozens of ways. The one claw is held at a bit of a distance in front of the other which is held at a bit of a distance from the torso. Obviously, these are stations of attack through which the opponent has to pass in order to hit you. Stations of attack, not defense; offense is defense. Then we have the forearm, the wrist, the hooked shape of the hand…each are weapons of attack, either in isolation or in concert with other parts of the body. I was taught as a form of basics to grip an opponent’s arm with the thumb and the three bent fingers while the index finger points toward a pressure point. So you practise this movement with the right hand, then the left, back and forth, against a willing partner, or you practise by throwing up a bag filled with gravel and catching it – right, left, right, left – or you practise your grip on a staff or the arm of a wooden dummy, and so on. If this movement were limited to solely grasping an opponent’s arm, then the mantis would never be able to fill up the buggy in a grocery store. The claw must have the same versatility as the Eagle Claw and the Monkey’s claw or Mantis long ago would have been phased out. The claw adjusts to whatever body part it encounters. If it touches the carotid artery then so be it, it “eats”, as a mantis would, the carotid; if the opponent turns his head, the claw may suddenly turn into a strike. I’m not quite sure whether a pair of little mantis friends who paid two weeks wages each for front row seats to watch a pair of humans go at it in some underground Fight Club style ring would recognize some of the techniques attributed to their own species. The Mantis approach is a volatile mix of rapid angle changes coming at you full blast. 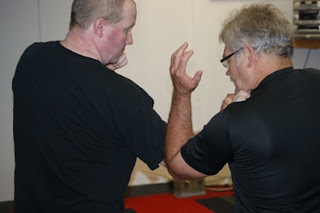 Sensei Gary Hollman, an instructor at 8 Wing Trenton Martial Arts Club, demonstrates two techniques from the en garde claw position for us against Sensei Jim Werden, a Black Belt student of Sensei Lynn Dafoe of the Elite Martial Arts Club in Belleville, Ontario, Canada. Both Hollman and Werden are Black Belts in Karate and in Jiu Jitsu who also practise the Chinese martial arts. 1. Hollman encounters one of Werden’s arms during an exchange. He grasps Werden’s right wrist with his right wrist from the inside. Normally, the grasp is done from the outside, against the back of an opponent’s wrist but you take what you can get, so to speak. Kung Fu isn’t a strait jacket; Kung Fu is alive, and the fight is ever-changing. Hollman’s left elbow from the Mantis en garde slices sideways into Werden’s arm, breaking it. Had Werden’s arm been raised higher, Hollman would have adapted the break…as much as he would have if Werden’s arm had been held at a lower level. For Hollman, whether the break really works or not doesn’t matter…he has tons more in his arsenal. 2. A standard throw that oftentimes follows the en garde position sees the left Mantis claw cutting from the inside to the outside against the side of Werden’s neck while Hollman sweeps Werden’s right leg. This throw, or takedown if you wish, again adapts in various ways to whatever the Mantis happens to encounter. Consider just the side of Werden’s head: the claw can strike the eye, rip the face, tear the ear, grab the hair, strike pressure points, hit the temple…and if Werden happens to slightly change the angle of his head, Hollman’s claw adapts.